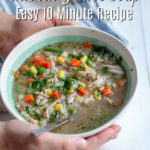 This quick and easy homemade chicken and rice soup is a simple and hearty meal that comes together in 5 minutes and is ready in 10. In a medium to large saucepan over medium high heat, add frozen vegetables, rice, diced chicken, and seasoning. Add in broth and bring to a boil. Toss in fresh parsley and boil for about 3-5 minutes until everything is cooked.